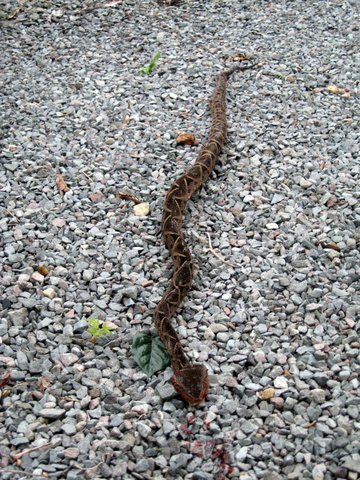 Neighbor killed a Fer de lance today...we killed one yesterday ( Brisas) Don't go sticking your hand in bushes doing weeding work. Boots, leather gloves...moth balls tossed in the beds a few days prior to weeding are all good ideas. As well, I have snake chaps I wear with boots when I'm in the field doing machete work. Be careful if you are new here....those snakes hide real well and can really do some damage. Wow! How big is/was this snake? I have seen posts by folks who believe we ought to be re-locating, rather than killing this species of snake. This raises a couple of questions; how could one safely do this, and where would one relocate them where these snakes would not pose an equal danger to people and pets? The one we got yesterday was a baby...maybe 6 inches long at the most. THOSE are the ones that can really do you in ! The one in the picture was taken a year or so ago off the back canyon ( just behind me) . We had let the wild grass get high and the gardener that was whackin the weeds down spotted it. He went home and got his .22 and nailed it in the head ( good shot). Now we keep the brush whacked low. The garden beds behind me?....I put mothballs in there and I don't worry about weeds until the dry season when everything thins out. As well I toss mothballs out on the hill behind me. If "they" wish to relocate the Fer de Lance(s) in my yard...they are welcome. A gardener here in my community got bit on the hand & he was foaming at the mouth and passing out before they could get him in the car. He was in the ICU a long time and has some neurological problems for awhile. He kept his fingers and lived only because he got to Regional Medical Ctr quickly. Our neighbor paid for his medical expenses and loss of employment. Fer de Lance are seriously bad. Talk to any Ngobe Bugle about snakes. They will keep you listening for at least a half hour talking about friends and relatives who died from snake bite. Gets your attention! Interesting about the moth balls. Do they really work? Thanks for your information. You can use Kangaroo...but it really stinks. The moth balls last in the rain and are cheap. yah...I HOPE they work ! I won't weed the beds until lots of moth balls are in there for a few days. ( the yard then smells like my mothers closet) Even then I prefer to let it go until the dry season. Then I go at it with leather gloves and a stick to spread the plants so I can see the ground and my hands....no surprises. I've included this entire thread for new folks here. The longer I live here the more stories I hear and snakes I see. I took poisonous snakes rather lightly when I was new here. I wasn't really as careful as I should have been. This is an internet photo of a snake bite on a finger. There were so many others that were worse....so that gives you an idea. BE CAREFUL where you walk and stick your hands. Gross but it gets the point across in that this is one of the less repulsive photos on-line. Ok here's something interesting... I was watching a nature show on TV. The guy was commissioned to catch Fer de lance in Mexico for a research facility. So the camera guys follow him around documenting tales of encounters as he goes on the hunt. He interviews a guy bit on the hand. He lost fingers...gone. But he lost as well part of his leg.....and was NOT bit on the leg. I'd LOVE to see that again because to this day I find this hard to believe. But the explanation was the venom traveling in the body can do this. There is no place to safely relocate a fer de lance. They are aggressive and deadly throughout the country, particularly to people who are far from medical care, as so much of the population is. I'm all for letting non-poisonous snakes and even some poisonous but non-aggressive snakes live in peace, but not the fer de lance. Team Snake Panama - the experts! My husband was out walking the dog this morning and observed a young father with child walking across an uncut field of waist high weed grass in our subdivision. The man was wearing flip-flop shoes. Now yesterday we had a boatload of rain...it was a wet field known to be loaded with Fer de Lance. My husband made it a point to talk to the fellow about the danger of walking through that field like that. The mans response: " I've never seen a snake here" My husband reiterated that it was in fact high on the danger scale to walk through there like that ( in flip flops and with a youngster mind you) . The only thing we can come away with, is that these are new folks in town, and exactly why I started this entire thread on snake season in the first place. We may come off as "know it all" , "paranoid" ,"old farts lacking a spirit of adventure" but tell them anyway. As a first responder to a Fer de Lance snake bite, what should be done to minimize the body damage to the victim? Well the BEST thing is to develop an awareness of where they are and the avoid those places. High grass, bush clusters, dead leaves, rotten logs, moist areas, banks of river beds among rocks, caves, dark corners behind things..in your garage( found one there) or behind your propane gas tank ....then have a long walking stick that goes before you . Get the victim to the Regional Medical Center ASAP. Call Rodny to alert the hospital an possibly police en-route (just a thought) . REGIONAL...not a private hospital. 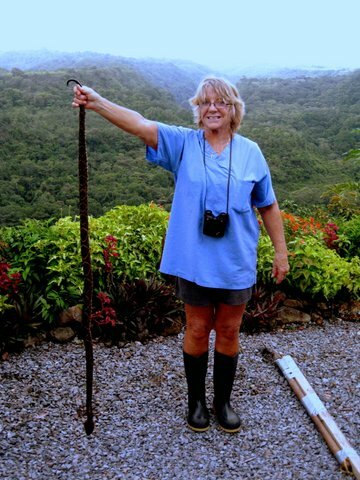 Locals tell me that evidence of "what snake' needs to accompany the patient. The gardener that was bit at a house next to us was being put into a car while his son whacked the snake to take with them... I assume you could take a picture. I believe a tourniquet above the bite is old medicine and an ace wrapping starting from above to end at the bite is more current...but I am not an expert. Seems ice would not be a bad idea. These are my thoughts on it...but again, I'm no expert. Thanks. Have to remember to check the garage area! Put some moth balls in the corners in dark spots behind stuff. Naphthalene balls...you can find them everywhere. Go easy in enclosed areas with poor ventilation where you are living ( inside the house) ...the fumes aren't great for the health. NO aspirin or other pain relievers. NO food or drink, especially not alcohol. NO tourniquets. This cuts blood flow completely and may result in loss of the affected limb. In worst case scenarios, thoroughly constricting tourniquets have been applied to bitten limbs, completely shutting off blood flow to the area. By the time the victim has finally reached appropriate medical facilities their limb had to be amputated. DO NOT use electric shock or a stun gun on the bite area. DO NOT wash the snake bite area - Australian recommendations for snake bite treatment strongly recommend againstcleaning the wound. Traces of venom left on the skin/bandages from the strike can be used in combination with a snake bite identification kit to identify the species of snake. This speeds determination of which anti-venom to administer in the emergency room. DO NOT try and capture the snake. If it's safe you can try to take a photo with a camera or with your phone. This is the best way in aiding snake identification. A snake can bite for up to an hour after it is killed due to reflex action. Application of potassium permanganate formerly known as permanganate of potash or Condy's crystals [or Guber's snake bite potion?]. This report of a venomous Black-Speckled Palm-Pit Viper (Bothriechis nigroviridis) was posted yesterday in the Panama Birds & Wildlife Photos blog. Found in the mountains of Costa Rica and Panama. 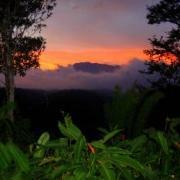 Also found in the cloud forests of the Cordillera Central and the Cordillera de Talamanca at 1,150-2,400 m altitude. The type locality given is "Vulcan von Barbo" (Volcán Barba, Costa Rica). While at the Embassy Outreach at the Library in Boquete I met a man from David that was telling me he killed one in David. He said it was at night and he had stepped out on his back porch. He saw it move and didn't realize what kind it was until he had stomped it to death with nothing but flip flops on his feet. Afterwards he saw it was a Fer de lance. He said the woods are behind his property. I think it scared him at that point thinking how stupid it was with flip flops on his feet and how it could have been a whole other story had he been bitten. Just saying they can also be in the lowlands, so people in David need to be careful as well. It actually was a funny conversation. When he told me this I said "well that was stupid" and then apologized. He laughed out loud and admitted that yes, it was stupid. My reply related to the Palm Pit Viper. The fer de lance is just the opposite. They prefer the lowlands. The upper limit of where you are likely to find the fer de lance is 4000 feet altitude. They are seldom encountered in the mountains surrounding Boquete but a are common in Alto Boquete. I also have to say that I believe the man in David was most probably mistaken about what kind of snake he encountered. I've never heard or read of anyone stomping a fer de lance to death. They're simply too fast.